According to the U.S. Census Bureau, the number of daily bicycle commuters increased from 5,956 in 2000 to 15,096 in 2010. Chicago has slightly more bike commuters than the national average: 1.3% of all commuters in 2010 compared with 0.6% of workers nationally. Chicago is third in the number of bicycle commuters among major U.S. cities and second among the 12 largest cities. Chicago has more bicycle commuters per capita than New York or Los Angeles. Chicago has more than 100 miles of bicycle lanes and bike parking. Spurred partly by public policies promoting cycling, bicycle commuting has taken off in Chicago as in few other major metropolitan areas in the United States. Since 2000, the number of people commuting to work by bicycle in the city has more than doubled, likely reflecting higher fuel prices and greater environmental consciousness over the time period. But with more workers than ever commuting by bicycle locally and nationally, there has inevitably been an increase in traffic accidents involving bikes. There were nearly 9,000 accidents resulting in injury between 2005 and 2010, with 32 fatalities. All but one of the fatally injured cyclists were not wearing helmets. The highest number of all crashes in the time period (both minor and serious) occurred in 2007, with 1,799 accidents. More than half of all crashes in the city occurred at intersections, with three-way intersections being a particular hazard. The most common motorist error was failure to yield to a bicyclist. The most common bicyclist error was riding against traffic. Taxicabs were involved in 8.4% of bike crashes. Passenger cars, as opposed to SUVs or trucks, were involved in about three-quarters of the bike crashes. However, the number of SUVs involved in crashes has risen steadily each year, from 87 in 2005 to 165 in 2010. Overall, males were three times more likely to be involved in a bicycle crash than females, mirroring national statistics. Males account for approximately two-thirds of all miles cycled by Chicago residents but account for 75% of injury crashes and have twice the fatality rate of females. Illinois and Chicago more or less follow national trends for bike-related injuries and deaths. Nationally, bicycle-related fatalities rose 9 percent from 2010 to 2011. In the greater Chicagoland area, serious crashes involving bicycles jumped about 11 percent from 2009 to 2010, according to the Chicago Metropolitan Area for Planning (CMAP). 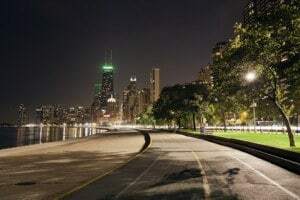 Within the city itself, the Chicago Department of Transportation reports that bike crashes resulting in injury increased 27 percent in the six years between 2005 and 2010. Areas just north and northwest of the Loop accounted for more than one-third of accidents resulting in injury or death. Unsurprisingly, about half of all crashes over the 2005-10 time period occurred during the summer months of June, July, and August, but surprisingly, the most crashes overall occurred during daylight hours and in good weather. Most troubling is that bicycle crashes are increasing as a percentage of all transportation-related crashes. Can I recover compensation for a hit-and-run accident? If the driver who hit me was working at the time, can I sue the company? How long do I have to file an Illinois bicycle accident lawsuit? What type of compensation can I receive for a bike accident lawsuit? 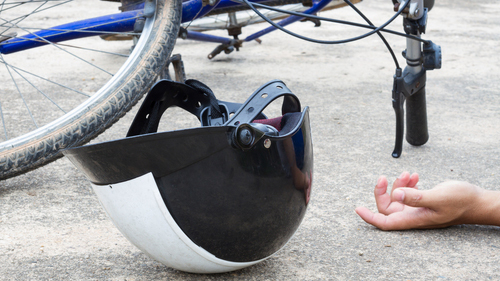 What can I do if my child was hit while riding his bike? Do I need to hire a lawyer for my bike accident case? Learn the in's and out's of your case from an experienced attorney who wrote the book on Bicycle Accidents.